Arab terrorist runs down 4 soldiers at village near Beit Aryeh, one victim seriously wounded, three lightly. 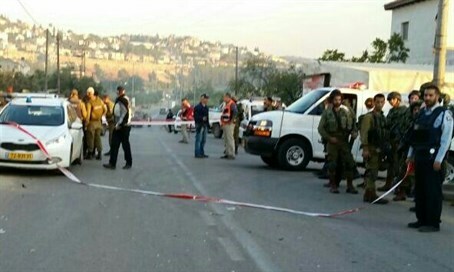 An Arab terrorist conducted a car attack on Thursday afternoon at the village of Al Luban adjacent to the entrance to Beit Aryeh, a town in Samaria just over the 1949 Armistice line to the east of Petah Tikva. Four soldiers all aged 20 or so were wounded in the attack, one moderately to seriously and three lightly. They were brought in for initial medical treatment in Beit Aryeh. The moderately to seriously wounded soldier was evacuated to Beilinson Hospital in Petah Tikva, while the others were treated at the site. Witnesses say the Arab terrorist fled the scene driving in a black Isuzu car. Police and army forces are conducting a search after the vehicle. Earlier on Thursday morning, a baby girl about six-months-old was lightly wounded when terrorists threw rocks at an Israeli vehicle traveling from Beitar Illit towards Jerusalem. She was wounded by glass shards that reportedly hit right between her eyes. Shaul Nir who was wounded Wednesday in a shooting attack on his car near Avni Hefetz continues to be in serious condition according to reports Thursday morning from Beilinson Hospital in Petah Tikva. His wife Rachel was lightly wounded in the attack. It appears that more serious wounds were miraculously avoided for the couple as one of the bullets hit a ten shekel coin that took the brunt of the blow, and another hit a water bottle in the vehicle.